Wifarer's award-winning indoor positioning apps help customers find what they want and engages them with hyper-local content and coupons. Go online for location analytics to discover what customers search for, where they go, and how long they stay. 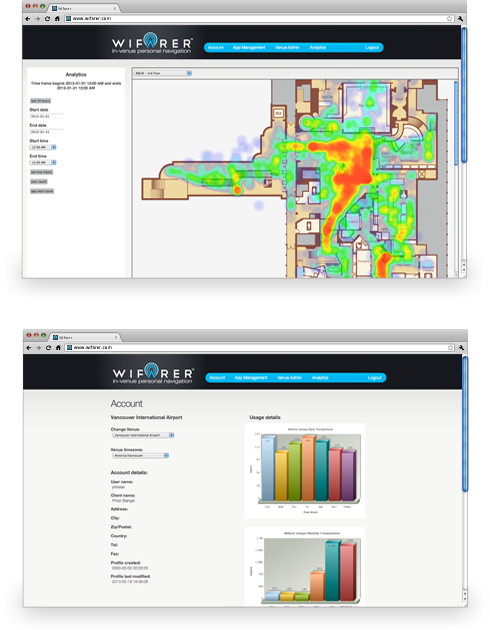 Indoor positioning technology drives powerful insight into customer behavior. Indoor positioning technology lets you automatically provide customers with offers and product suggestions at specific indoor locations. Indoor navigation to brands, products, and deals makes it easy for customers to find what they want and discover something new. Indoor positioning technology allows customers to save favourite locations and makes them easy to return to. Opt-in accessible routing for strollers and wheelchairs means everyone gets where they want to go with ease. Wifarer's online tools make it easy to create and manage content for your mobile app. Design a custom look and feel, upload directories, and attach rich media to any location with just a few clicks. Download the Wifarer app for free on Google Play and the App Store. ©2016 Wifarer Inc. All rights reserved.